Kia Motors has revealed the European specification of the Kia Stinger, a powerful new fastback sports sedan, following its global premiere at the 2017 North American International Auto Show (NAIAS) in Detroit on 9 January. 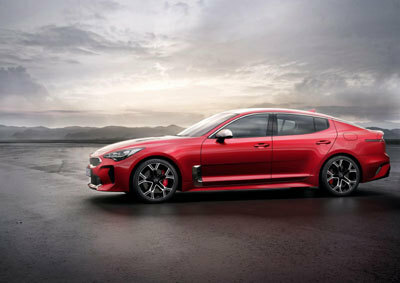 The new Kia Stinger closely follows the design and engineering blueprint laid down by the 2011 Kia GT Concept, and will be the highest-performance production vehicle in the company’s history. In Europe, the Stinger will be available with a choice of three engines: a 2.0-litre turbo petrol engine, a powerful 3.3-litre twin-turbo V6, and – announced for the first time – a 2.2-litre turbodiesel engine. From its sleek frontal section, through its svelte flanks, and up to its powerful haunches, the Stinger exudes a muscular confidence. Key to its road presence are its rear-wheel drive proportions – a long bonnet and short 830 mm front overhang, an extended wheelbase (2,905 mm) to deliver a spacious cabin, and a long rear overhang (1,095 mm) with strong, broad shoulders. The Stinger’s stance, proportion and visual balance are designed to lend the car an air of elegance and athleticism, rather than aggression and brutality. The Stinger measures 4,830 mm in length and 1,870 mm in width, making it longer and wider than many sport sedans, and allowing for a spacious cabin and cargo area. Aeronautically-inspired spoked circular vents feature in the front and rear, while a strip of satin chrome encircles the cabin. The effect is a feeling of cocooned intimacy. However, the long wheelbase, four-door body, and fastback silhouette allow for generous front and rear leg room, and the low seating position provides ample head room for all passengers. Cossetting occupants in luxury, the Stinger’s deeply-contoured seats are available with ultra-soft Nappa leather, while the driver’s seat is available with air-cell bladders in the seatback and side bolsters for optimal support. Announced for the first time today, the engine anticipated to account for the majority of Stinger sales across Europe is a 2.2-litre turbodiesel. The 2.2-litre engine is capable of producing 200 ps at 3,800 rpm. Its maximum torque output – 440 Nm – is available to drivers across a wide 1,750-2,750 rpm range, enabling the car to accelerate from 0-to-100 kph in 8.5 seconds, and on to a top speed of 225 kph. The 2.0-litre turbocharged four-cylinder ‘Theta’ engine produces 255 ps at 6,200 rpm. Its maximum torque output – 353 Nm – is available from 1,400 to 4,000 rpm. The Stinger’s most powerful engine is a 3.3-litre twin-turbocharged V6 ‘Lambda II’ petrol engine, with peak power of 370 ps arriving at 6,000 rpm, and 510 Nm torque accessible from 1,300 to 4,500 rpm. Stinger models powered by the 3.3-litre turbocharged engine can accelerate from 0-to-100 kph in just 5.1 seconds, making it the fastest-accelerating production Kia ever. With this engine, Kia is targeting a top speed of 270 kph. Comprised of 55 percent Advanced High Strength Steel, the Stinger’s bodyshell provides an ultra-stiff foundation for the car’s suspension components, and contributes to reduced noise and vibration for a quiet cabin. The Stinger also features an electronically-adjustable suspension system, Dynamic Stability Damping Control (DSDC). While always reacting predictably to the driver’s inputs, the system can be tuned via the Drive Mode Select depending on road conditions and driving style. DSDC can be used to firm or soften the front and rear dampers independently, for tailored ride, response and agility. Drivers can choose from five drive modes: Eco, Sport, Sport+, Comfort and Smart. A choice of alloy wheels and high-performance tyres are also offered. 2.2-litre diesel models ride on 225/50R17 tyres as standard, and 2.0-litre gasoline models are fitted with 225/45 R18 tyres, while the 3.3-litre V6 is fitted with high-performance 225/40 R19 and 255/35 R19 tyres on the front and rear. 3.3-litre V6 Stinger models feature high-performance ventilated disc brakes from Brembo® as standard (350 mm at the front, 340 mm at the rear), with quad-piston front calipers and dual-piston rear calipers. 2.0-litre models are fitted with ventilated disc brakes – 345 mm at the front, 330 mm at the rear – while 2.2-litre diesel models are fitted with 320 ventilated disc brakes at the front and 315 mm solid disc brakes at the rear. Other DRIVE WiSE features available include: Forward Collision Warning with Autonomous Emergency Braking and pedestrian recognition; Advanced Smart Cruise Control; Lane Keeping Assist System; Rear Cross Traffic Alert; Surround View Monitoring System for low-speed manoeuvres; Blind Spot Detection; and High Beam Assist. A new feature for Kia, the Stinger is also available with a Driver Attention Alert (DAA) system to combat distracted or drowsy driving. In Europe, driver fatigue is believed to be a key factor in up to a quarter of all fatal traffic accidents across the continent*, while the USA’s National Highway Traffic Safety Administration conservatively estimates that 100,000 police-reported crashes are the direct result of driver fatigue each year. In the USA, this results in an estimated 1,550 deaths and 71,000 injuries annually**. The system monitors a number of inputs from the vehicle and the driver, and will sound a warning chime and display a graphic in the instrument binnacle if it senses a lapse in concentration from the driver. The Stinger reflects Kia’s focus on offering the latest infotainment systems and driver technologies. A height-adjustable Head-Up Display (HUD) enables the driver to see key driving information reflected on the glass of the windscreen, including speed, turn-by-turn navigation guidance, audio, cruise control and Blind Spot Detection information. Resting within the centre console is a wireless smartphone charging pad, while Bluetooth integration is standard across the Stinger line-up. The Kia Stinger will enter production in the second half of 2017, and will go on sale across Europe during the fourth quarter of the year. Pricing will be announced closer to the Stinger’s on-sale date.